Substitute for Gerber DCS 1500 plotter blade. 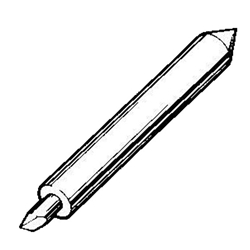 For best results, use the following recommened 35 degree angle substitute for Gerber #556928B plotter blade. This plotter blade was designed for cutting very small lettering and graphics. For best results, use for cutting on 2-6 mil material.